Figuring that the wind is less in the mornings than during the day we decided on an early start from Goldsmith Island. 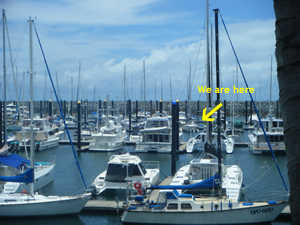 This wasn’t to be the case and we motor sailed the 26 miles to Mackay in over 20 knts of breeze. The sea was lumpy but the headsail settled the boat. Still we accomplished some 67 nms of tacking to get to the marina. Mackay Marina never fails to surprise Dreamagic. The last time I was here was in 2009 and the events of that visit were, well unusual. That’s for another story though. This time Rona and I went up to the marina to check in and enquire about hire cars. On return to the Dreamagic Isabelle had received calls from home and had to return to Sydney asap. Computers were fired up, flights were booked and within 20 minutes they were packed and in a cab to the airport with an hour to catch their flight. I hope everything is OK at home for you guys. Thanks for the trip, it was great sailing with you. Rona and I walked to the Sailing Club to consider the next leg of the trip south. The wind, which is courtesy of Cyclone Zellia shows no sign of dropping until about Tuesday. If we leave before then we’ll be bashed all the way south, if we stay until then we won’t get to Rockhampton in time for Rona to catch her plane to Brisbane for a Friday Meeting. We had booked a table for dinner at the sailing club but cancelled in favour of fish and chips at the café on the corner of the marina. As is often the case with problems, the solution becomes clear with time. N this instance we finally decided to leave the boat here for a week, get the Brisbane stuff out of the way and fly back to collect it next Monday. This gives us the time to bring iit down the coast without stressing it, or us. Arriving back at Dreamagic we booked flights to depart here on Sunday, returning Monday week. For some reason I felt completely drained after the past two weeks of sailing and was asleep by 8 pm.